Summer is here, which means it’s time for grilling. Everyone enjoys having their friends and family over for a cookout on a beautiful day. However, a fun gathering can quickly turn into a disaster if you aren’t careful while grilling. 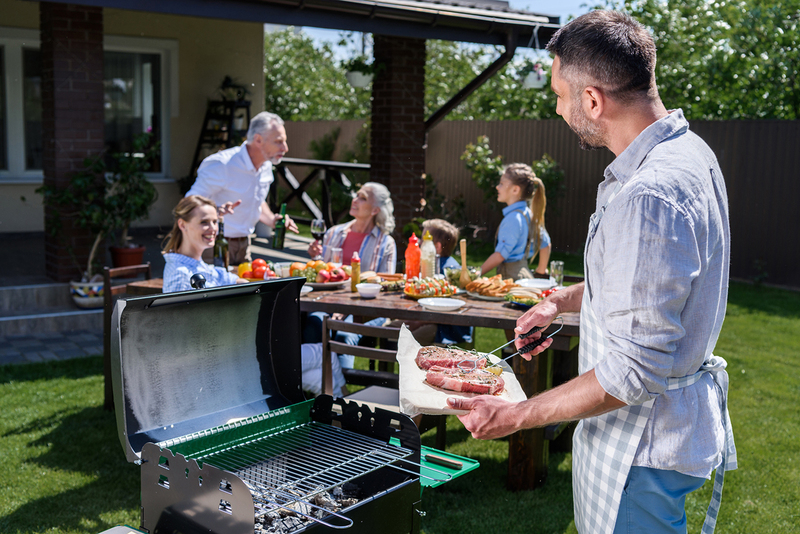 Use these grilling safety tips to keep your home, your family, and yourself safe this summer while using your charcoal or gas grill. Grill at least 10 feet from your house. This includes grilling away from your garage, porch, and carport. Never use your grill beneath a wooden overhang because the flames could flare up and catch the overhang on fire. Set your grill up on a flat surface and make sure that it cannot be tipped over. You may want to consider using a splatter mat or grill pad under it to protect your patio or deck. If you have a gas grill, you can easily check for gas leaks. Mix equal parts liquid dish soap and water, and rub the solution onto the grill’s hose and connections. With your grill’s lid shut, turn the gas on. If the soap begins to bubble, it’s a sign that your grill has a propane leak. Perhaps one of the most important grilling safety tips you should use is keeping your grill clean. Grease is a major cause of fire flare-ups, so keep your grill clean of grease and fat buildup. If you own a charcoal grill, let the coals completely cool off before you put them into a metal container for disposal. Keep baking soda nearby to put out grease fires. Never use water to try to put out a grease fire. You should also keep a fire extinguisher close by and learn how to use it properly before you begin grilling for the season. Never leave your grill unattended, as a fire can double in size in one minute’s time. Plan ahead and complete all of your other food preparations before you begin grilling so that you can focus solely on grilling when it’s time. Being mindful of what’s going on around the grill when it’s on. Your clothes can act as a fire hazard if they dangle over your grill, so ensure that your apron strings and shirt sleeves never dangle above the grill. Don’t allow your pets or children to play near the grill when it’s on. You should never try to move your grill when it’s on or hot. Remember that your grill will remain hot for at least one hour after you’re done using it. Grilling out is a great way to enjoy time with friends and family, and also helps keep your home cooler during summer by not cooking inside. But remember that using your grill has potential safety hazards. Use these grilling safety tips to keep yourself, your family, and your home safe during grilling season. Prime Home Inspections serves Seattle and Western Washington with home inspection services. Contact us to schedule an appointment.